A perfect relish or conserve for fall and winter use. Serve it with chicken, beef, duck or other game meat; it also makes a great spread or dip mixed with cream cheese. 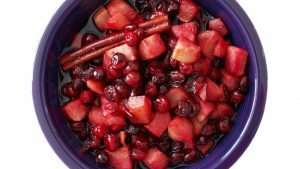 In a large pot combine apples, pears, cranberries, sugar, water and orange juice. Simmer, stirring frequently, for 15 minutes. Stir in the nutmeg and walnuts, and then cook for 5 more minutes. Use fresh or can for future use. To process follow these instructions. Place a whole cinnamon stick in each sterilized jar, then ladle the hot relish into jars leaving 1/4″ headspace. Process for 15 minutes in a boiling water canner.